I just started using My fitnesspal and have been doing ViSalus for a while now. I have been eating very healthy and nearly vegetarian, but I still have that sweet craving that I know I had to indulge in a little bit or I will end up splurging later on. This is where Almondina cookies come in very handy! Almondina has a touching story. It all started out with a man, Yuval Zaliouk, who was a music and cookie lover. He loved his Grandma Dina and her scrumptious healthy cookies and crackers in one. She would not give up her recipe until her final days, which she only gave her daughter who passed it on to Yuval Zaliouk. The name changed from what Dina called Petit Gateau Sec, to Almondina, in honor of her. Zaliouk went on to make these cookies, becoming demanded among the healthy eaters and selling off the shelves, turning into what it is today. I received a generous 7 packs in 6 different flavors and I loved them all! Original-Packed with yummy almonds and perfect for coffee and tea dipping. I also broke this up into pieces and put them into my greek yogurt. Sesame-Classic flavor for dipping in coffee or tea too. Gingerspice- This one is unique and tastes great dipped in my ginger tea. Cinnamon- Another classic flavor that is great with any tea or coffee. Choconut- A nice blend of coconut and chocolate. Why is Almondina a healthy choice? 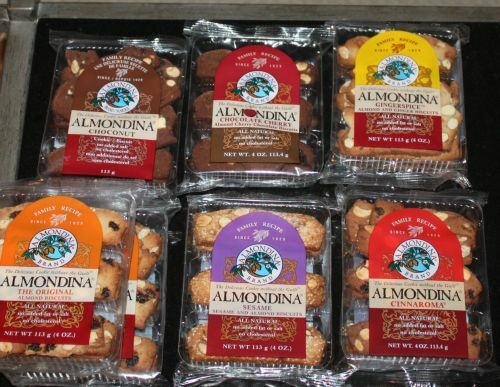 Almondina's delicious cookies have helped me to curb my sweet cravings by fulfilling my sugary desires with a few bites, but they taste as decadent as anything. Which is why i'm surprised they are not packed with sugar and calories. In fact, the only fat that exists in their regular almond variety is the naturally occurring kind in the nuts. These are my favorite go to next to the chocolate cherry almond. Another great thing is that if you are watching your cholesterol, you don't have to worry, because they contain none. Let's get more specific: Here's an examples of the Original flavor ingredients and nutrition facts. Almonds (24%) , wheat flour, malted barley flour, pure cane sugar, egg whites, raisins, natural flavours. Allergen info: Contains almonds, gluten and eggs. The raisins mixed with the almonds really make they so scrumptious and naturally sweet. There is no need for added sugars. Need I say too much of a good thing is bad for you so if you go over board, it will become much fattier. I get my fix with 4 or less, which is 1 serving size. If that's not enough reason to try them, check out the five healthy reasons they give you. They taste outstanding and they're not to hard or soft. I love dipping them in my tea and coffee and they make such a convenient and fast snack on the go! I will continue to buy these at my local Publix or Vitacost, because they are only, wait for it... $3.39 per pack! 4 cookies for 133 calories is a nice size snack. Love that these are made from Almonds too. These look good, I would love to have them to go with my coffee or hot tea! Yummy! I love little treats like this with my morning coffee! Oh gosh, those look wonderful. I really need to give this a try!